The Colorado River Indian Tribes is located in western Arizona at Parker, 189 miles from Phoenix. The Reservation spans the Colorado River and has land in Arizona (La Paz County) and California (San Bernardino). 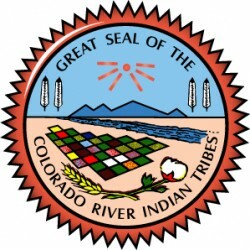 The Colorado River Indian Tribes’ Reservation was established March 3, 1865 for the “Indians of said river and its tributaries”. The Indigenous people were the agricultural Mohaves and the Chemehuevis. In 1945, a portion of the reservation was reserved for colonization by Indians of other tribes, specifically the Hopi’s and Navajo’s. The economy is centered around agriculture, recreation, as well as government and light industry. The fertile river bottom lands and available water allows the production of agricultural and produce such as cotton, alfalfa, wheat, feed grains, lettus and melons. Approximately 84,500 acres are now under cultivation and another 50,000 acres are available for development. The Tribes have senior water rights to 717,000 acre feet of the Colorado River, which is almost one-third of the allotment for the state of Arizona. The Colorado River is the Reservation’s greatest recreational and most scenic attraction. Lake Moovalya and Havasu are formed behind Headgate and Parker Dams. Facilities for swimmers, boaters and water skiers may be found along the 90 miles of shoreline. The CRIT Tribal Museum offers arts and crafts for sale. Museum admission is free, however donations are accepted. Please no cameras or video equipment allowed. Historic sites include the Old Mohave Presbyterian Mission and the Poston Memorial Monument, located 18 miles south of Parker. The Memorial Monument marks the site of the Japanese Poston War Relocation Center where 17,867 were interned during 1942-1945. Fishing for trout, striped bass, bass, catfish, crappie and bluegill is excellent in the river and 250 miles of irrigation canal. Dove, quail, waterfowl, rabbit and predator hunting is excellent. Reservation hunting and fishing permits are required. Camping permits are also available. (520) 669-7000 (www.bluewaterfun.com) The new BlueWater Resort and Casino opened its doors in June 1999. The Casino offers a Las Vegas style atmosphere with slots, bingo, keno and poker. There are two restaurants, one for fine dining, a snack bar and two cocktail lounges. 200 luxuary rooms and suites with river view are available as well as an indoor water park with four swimming pools, a water slide, children’s pool and Jacuzzi. Live entertainment is provided at the outdoor amphitheater. For those with watercrafts, the facility has a 164 slip private marina. Miniature golf is available along with Olympic style exercise center, and various retail shops. The resort and Casino also features over 8,000 square feet of Conference Center with banquet and catering services. And, finally, a four-screen theater will open within the coming months. The land, the water and the climate make the Colorado River Indian Reservation an ideal vacation, business or retirement location.